Where: Build It Live Bicester will take place at Bicester Heritage, Oxfordshire. Transportation: Regular trains run from London Marylebone to Bicester North or Bicester Village train stations. From Bicester North you can travel by taxi (approx. 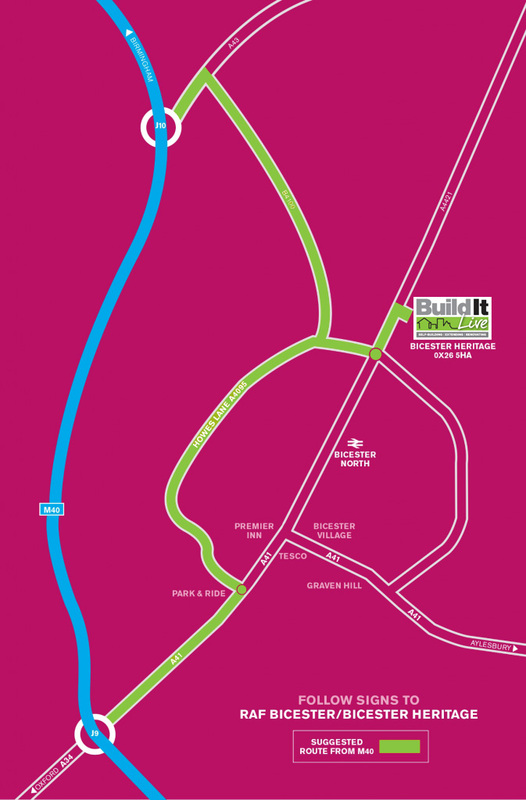 8 minutes) to the Build It Live site, or take the X5 bus (run every 30 mins), to the Bicester Heritage stop, (approx 6 minutes). Accommodation: Discount accommodation is available for visitors and exhibitors. Please click here to book. *Please note, this event is taking place in a dedicated area on the site of an active airfield and parking and attendance is at visitor’s and exhibitor’s own risk. Random bag and vehicle searches may be implemented at the show for security purposes. All animals are prohibited, apart from registered assistance dogs. Open Saturday between 10am and 5pm and Sunday between 10am and 4.30pm. Your ticket will be valid on either day, and you can attend on both days if you wish! By Car: The Kent Event Centre is easy to reach by car. It is located on the A249, which is a dual carriageway. From the M20 Motorway, exit the motorway at junction (7) and follow signs to Sittingbourne and Sheerness A249. The Kent Showground is clearly marked and is approximately 2 miles from the Junction. From the M2 Motorway, exit the motorway at junction (5) signposted Maidstone A249 – The Kent County Showground is approximately 5 miles away. Car Parking: Unlimited parking is available next to the exhibition halls. By Bus: Bus stop 10 minutes walk from Maidstone East. Chequers Bus Station (Stop H4 to Kent County Showground). Take the bus 333 0r 334 running every 30 minutes, (9 or 39 mins on the hour). Total journey time is approx 35 minutes (10 stops). Where: Build It Live North West takes place at EventCity in Manchester. Address: HALL 1, EventCity, Intu Trafford Centre, Phoenix Way, Off Barton Dock Road, Urmston, Manchester M41 7TB Click here for a map. For Sat Nav purposes, please use postcode M17 8AS. Car Parking: There are over 3,000 free parking spaces available at the venue. By Bus: X50 – Manchester City Centre’s Express Service. The Trafford Centre’s high frequency express bus link leaving Piccadilly Gardens Bus Station Stand K every 15 minutes from early until late 7 days a week (via MediaCityUK Manchester and MUFC). 250 – Stagecoach Manchester Bus Service. The Trafford Centre“s high frequency bus link direct from Piccadilly Gardens Bus Station Stand K every 15 minutes from early until late 364 days a year (via MUFC and Manchester University). Trafford Bus Station: This is approximately 10 minutes’ walk from EventCity (see map) and serviced by bus routes from all over Greater Manchester. There are frequent buses providing a connection every 5 minutes (services 18, 247, 250 and X50) from the bus station to EventCity. By Train: Manchester Piccadilly – Bus service X50 or 250 from Piccadilly Gardens Bus Station descending at the EventCity bus stop. Manchester Victoria – Bus service 100 (every 12 minutes) or Service 110 (every 20 minutes) descending at The Trafford Centre bus station.